Sugar Industry: Burn Calories by Styling Your Hair! Our concerns regarding industry influence of the Academy of Nutrition and Dietetics do not simply apply to partners and sponsors. We also think AND leadership needs to be much more diligent of who it allows to have a booth at FNCE — its annual conference. Consider, for instance, The Sugar Association. It has had a booth at FNCE for years, offering materials that dietitians are meant to share with patients. The photograph above is just one page of a larger pamphlet. Note the so-tired-it’s-almost-comatose “sugar is all-natural” claim. The fact that something is natural has nothing to do with its degree of healthfulness. Also note the obfuscation on the role of added sugar in weight gain. It is true, of course, that all calories count. However, we also know that calories from added sugar are not as satiating as those from other nutrient sources, and that they also are devoid of vitamins, minerals, and fiber. And, lastly, we have industry’s favorite: “just burn the calories off!” — as if health were only about caloric quantity and not nutrient composition/caloric quality. 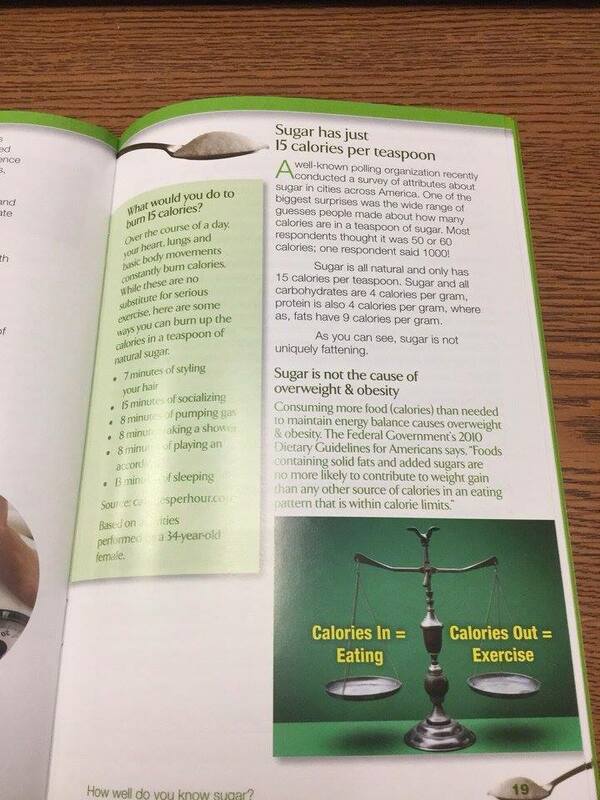 Even more absurdly, The Sugar Association suggests burning off the calories in one teaspoon of sugar by styling your hair for 7 minutes, pumping gas for 8 minutes (? ), or socializing (??) for 6 minutes. Even more of a reason to set standards around who is given access to dietitians at FNCE.